When Donald Campbell's rebuilt Bluebird K7 made a return to water more than 50 years after the crash that claimed the record-breaker's life, it was hailed a triumph of engineering ingenuity. But its next outing has been abruptly called off amid tensions about what its future should hold - and even disagreement about who owns the craft.Its paintwork glistening in the afternoon sun, and with onlookers peering excitedly from the water's edge, it was a moment long in the making.Seventeen years after Bluebird's mangled wreckage had been raised from the cold depths of Coniston Water in the Lake District region of north-west England, a painstaking reconstruction project had seen it pieced together again by an ardent team of volunteers.As the jet engine fired up and a plume of kerosene-tinged spray shot forcefully across a Scottish loch, Bluebird was alive once more.It was something many had never thought possible. On 4 January 1967, Campbell had propelled the machine to its very limits in an effort to smash through the 300mph (480km/h) barrier.Unable to wrest it back under control, his hydroplane violently lifted from the lake's surface before smashing down with ferocious, frightening force.Its pilot, perhaps the last from an era of great British adventurers, paid the ultimate price.Those final, foreboding moments, captured in grainy black-and-white film stock, have horrified and intrigued ever since. With a tartan-clad pipe band providing a hero's welcome and Bluebird hitting speeds of 150mph (240km/h), the mood on the Isle of Bute last August was triumphant.Questions inevitably followed about the vessel's future.The months since have seen the two sides involved in the transformation surrounded by choppy waters, with disagreements over the craft's next run, whether it should become a permanent museum exhibit - and even who owns it.Anticipation had begun to build ahead of a proposed July 2019 return to Coniston, but those dates were postponed last month by the Bluebird Event Working Group comprising villagers, business representatives and councillors.For Bill Smith, the engineer who has led the recovery and rebuild, the two-week test in western Scotland had been vindication for the countless hours of toil in his North Shields workshop.There his separate Bluebird Project team busied itself, doggedly refashioning crumpled metal and replacing original parts damaged beyond repair by the savage impact of the crash. "It's a living, breathing, educational piece of history," the 51-year-old beams enthusiastically. "Now it's about letting as many people as possible see it, getting the thing out there to inspire. "Lock it away and interest will wane. It just will. "If it's being used on a regular basis then it smells alive, it feels alive. "It's got scratches and dings and dents where we've hit it. It has a soul now and you don't want to kill that off again." The United States, Australia and France have all been suggested as possible destinations in the years ahead.But Mr Smith's vision has put him at odds with the working group, which favours Coniston as the most fitting place for one final outing before the machine forms the centrepiece of the purpose-built Bluebird Wing in the village's Ruskin Museum.While open to a Lake District return, Mr Smith dismisses the suggestion it is the craft's "spiritual home". "I hear this all the time and, OK, that's how a lot of people feel. "Because of that there is just far too much expectation on this whole Coniston thing. "It's this idea that it's somehow sacred. Right or wrong, it ratchets the whole thing up. "In contrast to Loch Fad, which can be closed to other users, Coniston's open right of navigation makes obtaining permission to run Bluebird much more complicated.As swimmers, boat owners and anyone else who can legally access the five-mile (8km) stretch of water cannot be prevented from using it, a detailed public event plan must be submitted to the Lake District National Park Authority.Having announced the provisional dates last October, time to make sufficient preparations for this summer simply ran out, says Tracy Coward, chair of Coniston Parish Council. "Due to the complexities with things like traffic management and public safety on and off the lake, we need more time to organise things logistically. "It's very disappointing, but it's a nationally significant event and we want it to be successful. "Running on a privately owned loch is very different to a lake in a national park at the busiest time of the year." Mr Smith, who says he is confident he will soon be able to confirm an alternative destination for Bluebird's next outing, is critical of the working group's efforts. "Nothing was done for years with a view to Bluebird going back to Coniston and being put on the water to run. "It's tragic. It shouldn't have happened that way. "You organise a music festival and your headline act just turns up, plugs in and starts to playThat metaphor is met with bemusement by Anthony Robinson, who until recently held the position of working group chairman. "It's not showbiz," he says wryly. Part of Campbell's support team when the daredevil decamped to the Lake District in the winter of 1966, the pair had a friendship stretching back almost 20 years. 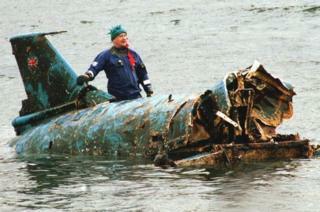 "Robbie", as Campbell affectionately called him, was first at the crash scene on a marshal's boat. "It [Bluebird] literally landed more or less in front of us and rolled a few times. "It sank before we actually got out to it. I didn't feel anything. It was too much of a shock. "For a long time you knew it had happened, but it didn't register." Many cheered Bluebird's Bute renaissance, but Mr Robinson was less celebratory. "I didn't really watch much of it on TV. It's personal. "For me it just ceased to feel like a proper Campbell-Bluebird effort, and for one obvious reason. "There was a man missing. He was the pilot and it was generally known Donald didn't like anyone else sitting in the cockpit unless they were there for a purpose. "Although Mr Robinson is quick to praise the work carried out by the Bluebird Project, he rejects Mr Smith's downplaying of the craft's Coniston heritage. "They've done a magnificent job; no-one can deny them that," Mr Robinson says from a reception room of the guesthouse he runs. "They've done an awful lot of work. [But] I've got to say, that sounds like desperation. "They're synonymous [Coniston and Bluebird]. Donald was very well liked in this village, very much respected. "For many years people never tried to make anything of it financially because they felt they would be making money over a dead man's grave, as it were, but then I think we came round to thinking you don't want him to be forgotten." Further disagreement surfaced when Mr Smith made clear he views the Bluebird Project as a "co-owner" of the craft with the Ruskin Museum.However, curator Vicky Slowe states a 2006 document signed by the Campbell Family Heritage Trust is explicit in granting legal ownership to the museum.At a cost of almost "It was stipulated the work should be done by Bill Smith and, thirdly, that we created a new exhibition to tell the story. "Please don't think I'm disputing the quality of the work they've done. They've given many, many years to it. "I understand that, as engineers, they think machines should work. But more and more of the original materials might have to be reinforced and replaced. "It's a labour of love that's created a sense of possession." Standing waterside at Loch Fad last summer, Gina Campbell told the BBC her views had changed having seen her father's vessel brought back to life. "Months ago I'm thinking she must become a museum piece," she said, before explaining that she's changed her mind about Bluebird. "She's not ready to sit in a crusty old museum. "Mr Smith agrees and is calling for a part-year display at the Ruskin. He wants a new contract drawn up with an agreed number of months set aside during which the hydroplane would run. "The reality of the situation is that in 2006 Gina Campbell, on behalf of the trust, gifted the museum the wreckage and the deal was I had to rebuild it," he says. "That wreckage was only half a boat. "We bought all kinds of bits and pieces and our volunteers made those materials into new components. "You've got the sponsors, the nose, the hydraulics, the electrics, the cockpit, the canopy, the engine. That is all our creation and that is all our private, tangible property. "We don't own it because we said 'we've done 15 years therefore we want half'. We own it because we bloody well created it. "It was lifted [from Coniston Water] to protect it. There was no way on Earth to say then whether it could ever be put back together, much less run. "You look on the [museum] website and the perception is it's coming back. Yeah, that probably was the perception 10 years ago, but things have moved on." Both sides reluctantly admit lawyers might eventually become involved in a bid to break the impasse.Mr Robinson describes it as a "delicate situation". "There is an ongoing legacy, which is what this is all about as far as the village is concerned. "I find it a bit disappointing and frustrating. 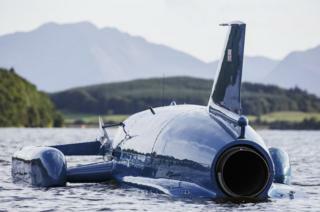 "I think the whole project was supposed to remember Donald Campbell and Bluebird. "Somehow or other, they seem to have slipped down the agenda. ".